The State Department on Wednesday criticized Israel for approving the construction of over 500 housing units in Jewish neighborhoods in eastern Jerusalem. “Our position on Jerusalem is clear,” State Department spokesperson Jen Psaki told reporters when asked about the construction. “We oppose any unilateral actions by either party that attempt to prejudge final status issues, including the status of Jerusalem. We’ve called on both sides to take steps to create a positive atmosphere for the negotiations. And that is certainly a message we’re sending on the ground as well,” she added. The newly-issued building permits include 386 units in Har Homa, 136 units in Neve Yaakov and 36 units in Pisgat Zeev. Earlier Wednesday, the construction was also criticized by leftist groups, including Peace Now and the head of the Meretz party, MK Zehava Galon. “We are talking about building permits, which is really the final stage,” Peace Now spokesman Lior Amihai told AFP. “It’s a shameful decision, at a shameful time. A government that wants a two-state solution would not issue those amount of permits for east Jerusalem neighborhoods,” he charged. Senior Palestinian Authority (PA) official Hanan Ashrawi joined Peace Now and Galon in condemning the decision. “Israel is engaging in the deliberate provocation of the Palestinians to drive them to leave the negotiations in protest of Israeli violations, and therefore should be blamed for the destruction of the peace process,” she said in a statement. Ashrawi’s criticism should come as no surprise, as the PA has repeatedly slammed Israel’s planned construction in Judea, Samaria and Jerusalem, despite the fact that it was informed in advance that Israel will continue to build as talks continue. The areas in which Israel plans to build are areas that even the PA has previously accepted will be part of Israel in a future deal. 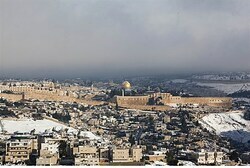 Last month, Israel announced the construction of over 1,800 new housing units in Jerusalem, Judea and Samaria.